Many tools that support regular expressions (regexes) support positive and negative lookahead. What good is lookahead? Why would you ever use it? What then, said I, shall I do? You shan't, he replied, do anything. Notice that this gets me the comma too, though, which I would then have to remove. Wouldn’t it be better if we could express that we want to match a word that is followed by a comma without also matching the comma? Without atomic grouping (the (?>…) in the regex), when the regex engine sees that a match-in-progress comes up against a disqualifying comma, it simply backs off one letter to complete the match: the + in the regex gives the engine that flexibility. Applying atomic grouping disallows this and says, don’t give up characters you’ve matched. Thanks to Jeffrey Friedl for writing Mastering Regular Expressions, 3rd ed., before reading which I had not even heard of regex lookahead. 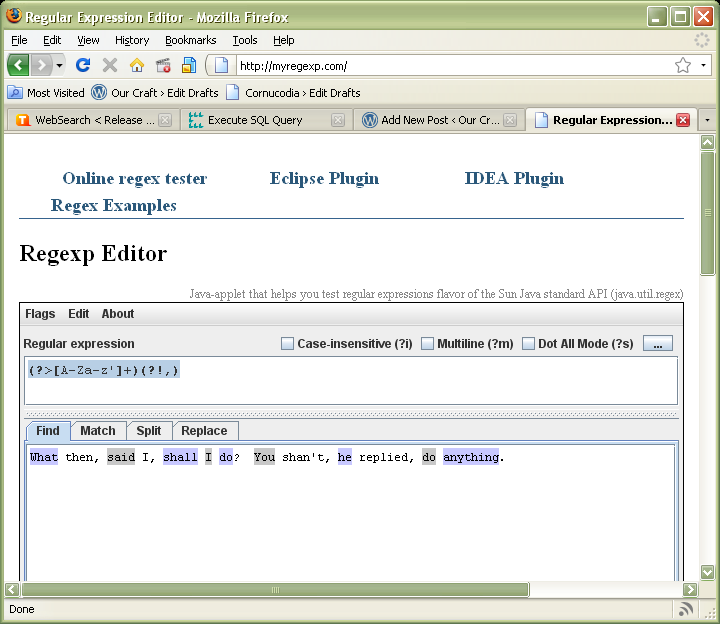 Also, thanks to Sergey Evdokimov for his online Regular Expression Editor. Handy! This entry was posted in Technical Stuff and tagged regex by danielmeyer. Bookmark the permalink. I thought I’d point out another online regular expression editor that I use: Rubular. Thanks for the article, by the way. I didn’t know about the lookahead feature. It would be from performance and regular expression semantic, much better to use matching and negative character class. ([A-Za-z’]+)([^,]|$) # followed by non-coma, or end of string. I want a regex that will validate number between 1 to 9 except 7. i.e, it will initially check if a given number is in the range of 1 to 9 , if true then another check will make if that given number is 7 or not. If its 7 then fail else pass. Does anyone have any idea. Your help will be highly appreciated . Why don’t you write out your best guess, and then we’ll work on it from there.